ISHIKAWA WIRE NETTING Co.,Ltd was introduced in the January 25th, 2019 issue of "Arakawa Kuho Jr."
2019.03.13 ISHIKAWA WIRE NETTING Co.,Ltd was introduced in the January 25th, 2019 issue of "Arakawa Kuho Jr."
Recently, the scenes as junior reporters from "Arakawa Kuho Jr." visited ISHIKAWA WIRE NETTING Co.,Ltd were introduced in the January 25th, 2019 issue. The theme was "Arakawa, the town of craftsmanship." Among the backdrop of the year-on-year decline in manufacturing businesses, the project aims to take the techniques that are circulating the world of Arakawa craftsmanship and connect them to the next generation. 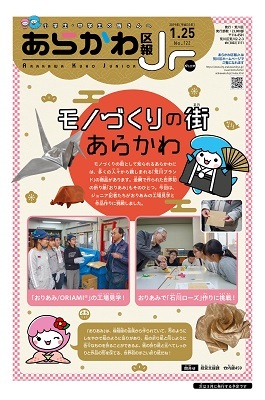 On this occasion, after the junior reporters had observed the production process of Wire Mesh Origami "Fabric Metals ORIAMI" at the ISHIKAWA WIRE NETTING Co.,Ltd factory, they attempted to make Ishikawa Roses with "ORIAMI". The scenes of that visit by the junior reporters appear across three pages. Creating the Ishikawa Rose is quite a difficult task, but after initially struggling, in the end, they were able to make them beautifully. We are delighted with the passion they showed in their questioning and the joy with which they endeavored to create things out of "ORIAMI". ISHIKAWA WIRE NETTING Co.,Ltd will continue with our initiatives in order to pass on techniques to the next generation.